Today, in the 21st century, menstruation is considered as unclean and a bad omen in many developing countries. Since the society is not comfortable with discussing menstruation, girls would have little to no knowledge about their periods. A 2014 survey revealed that 1 in 3 girls in Bangladesh did not know about menstruation before having their first period. In developing countries, there is still considerable embarrassment and shame around periods. The challenges Bangladeshi girls need to go through during periods are unbearable. They do not have access to hygienic sanitary pads because they cost too much. Instead, they are forced to use old bits of cloth to curb the flow of blood. As a result, many girls skip school during their periods because of the embarrassment caused by period leaks and the absence of sanitation facilities in most schools. When girls skip school, which can be for around 7 weeks per year (approx. four days each month), they miss out on lessons and achieve poor grades. With time they then drop out of school because they become demotivated. With Plan International’s support, women in Bangladesh started their business selling homemade sanitary pads along with other personal hygiene products. The affordable napkins have made girls more comfortable going to school during menstruation. Lucky, aged 40, lives in the Barisal district of Bangladesh. She runs a small shop located in an accessible bazaar and has asked local girls to manage the shop. Lucky sells sanitary pads to girls from the local community. 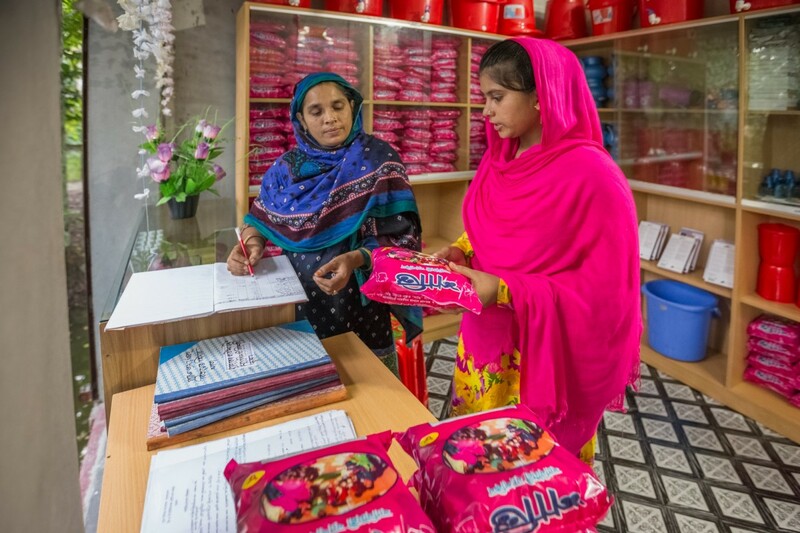 Plan International also provided Lucky and the girls with training and equipment to create sanitary pads on the premises – and turn a profit. Napkins are sold either directly to customers at Lucky’s shop or stocked within local pharmacies, shops, health centres and schools. 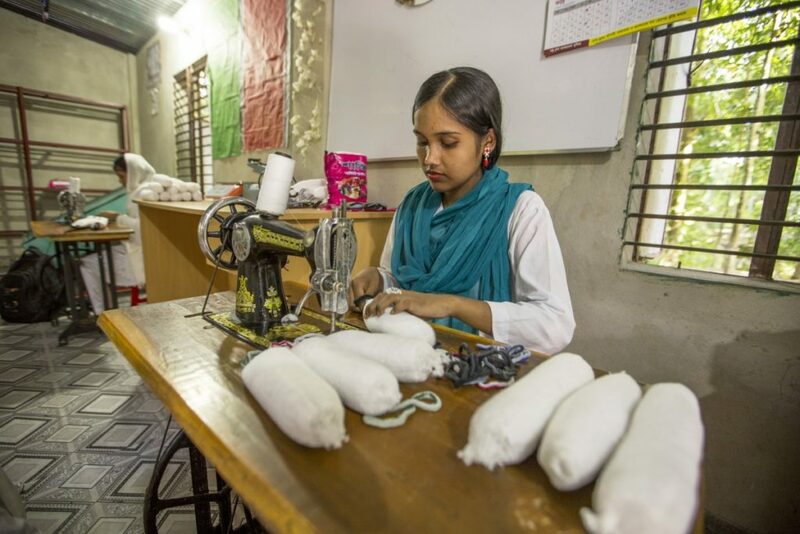 A girl uses sewing machine to seal the sanitary pads. 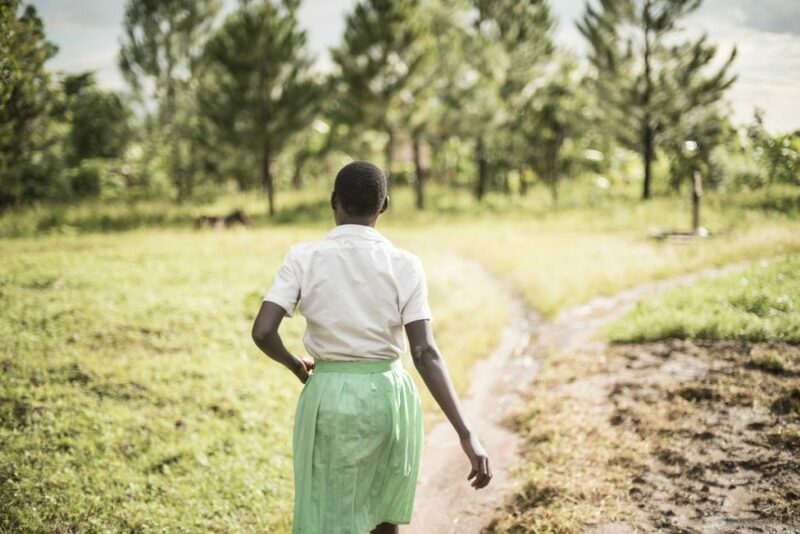 The stigma around menstruation has a detrimental impact on girls’ health and wellbeing. Girls around the world deserve to live healthily, and with dignity and respect. The biological fact should never hold girls back from pursuing their dreams.